Can foreign policy be ethical? The late Robin Cook, Foreign Secretary in the 1997 Labour government, promised an "ethical foreign policy", raising a few wry smiles. Nine years later it sounds like a sick joke. Britain is involved in military adventures across the globe and has effectively subcontracted its foreign policy to the US. Supporting extraordinary rendition, the US policy of using torture in prisons around the world. Blair outlined the strategy in his Chicago speech earlier this year. Today, it is known as neoconservatism, but really it is just good old colonialism and imperialism. But it's not just a strategy; it has been put into practice. There was the bombing campaign against Iraq in 1998 eloquently named Desert Fox and used by Alan Milburn, then Health Secretary, to publish his PFI plans for the NHS in the hope no one would notice ("a good day to publish bad news"). Then there was the 1999 bombing and invasion of Yugoslavia with Blair presenting himself as the messiah saving the poor Albanians, resulting in a gangster statelet occupied by EU/NATO and Serbia as a US vassal state. Then in 2000 it was Sierra Leone, the only former British colony that attracted Blair's intervention. Perhaps it was because his father once worked at a college in Freetown and so there were already contacts there. This was followed by Afghanistan in 2001 (although only seriously pursued this year) and the invasion of Iraq in 2003. Labour Party members and trade union affiliates may well ask when these principles of foreign policy were discussed within the party – or within government. We learned from the "Blunkett Tapes" that defence secretary Hoon agreed to the US use of Fylingdales as part of their new "Star Wars" defence system without consulting anyone at all. We are told that there will be an EU Foreign Minister, moving responsibility for foreign affairs to Brussels. This foreign policy has gone hand in hand with moves to control us at home – attacks on pensions and health, more privatisation, EU immigration to undermine wages and jobs, plus laws to make it practically impossible to have a legal strike. Blair even refuses to notice that things are changing in the US as Bush desperately seeks to avoid defeat in Iraq. The Baker Commission is suggesting asking Syria and Iran if they will help the US get out with grace. Even Bush has now made the comparison with Vietnam. The head of the British Army says that the presence of British troops in Iraq has exacerbated the security situation there, around the world and at home. He calls for withdrawal from Iraq, where British troops are now effectively held hostage in bases across the south of the country while the Iraqi police are taken over by religious militias. British Intelligence, as if to back up the general, says that Britain is now the main target for al-Qaeda terrorists and will be so for an entire generation. But Blair denies everything. He has been best described as resembling a provincial governor of the Roman Empire in some remote garrison: surrounded, under attack and waiting for orders to come from Rome (or in his case Washington) before deciding what to do. Is an ethical foreign policy possible in a capitalist country? A capitalist government is there to serve the global and local needs of capital, a very unethical economic system that seeks only to increase itself. Blair's foreign policy serves the global needs, just as his domestic policy serves the local, where his job is to attack and control the working class at home. 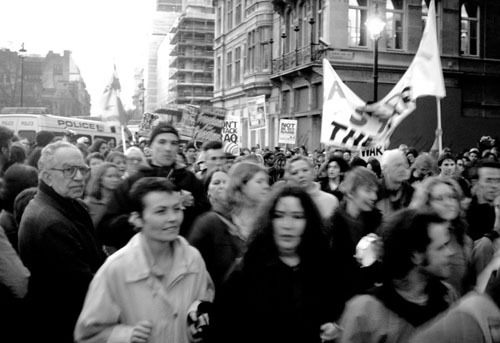 Marching in London to stop the war, 19 March 2003: Blair's Iraq war showed that ethics resides in the people, not the government – the war began the next day. But what may constitute a genuine "ethical foreign policy"? Is such a thing possible? Supposing the British government declared it would recognise the sovereignty of all nations, respect their right to choose their system of govern-ment, not interfere in their internal affairs, and encourage trade on the basis of mutual benefit? That might be a start. We could then withdraw all our troops from Iraq, Afghanistan and former Yugoslavia. Why do we still need an army in Germany? We could close all foreign bases including those in Cyprus. We could then close all US bases in Britain. Then we could address those colonies that still exist – the Falklands or the Malvinas could be returned to Argentina, Gibraltar to Spain, and Diego Garcia to its people (or more properly, its people to Diego Garcia). We could join those seeking to reform the UN to make it reflective of the individual member states and not the US. We could define exactly when our troops may be used overseas, for example to assist in disaster work, or on special agreed UN missions that were clearly intended to help workers rather than capitalism. Of course, if we were to do all this as a sovereign nation, it would be incompatible with our membership of NATO and the EU. So we would leave both of them. The issue of Trident would no longer be relevant: the US would not even think of selling a replacement system outside NATO. Our arms industry is an important part of British manufacturing and is central to defending our own borders. Sovereign nations have a right to defend themselves. If the arms industry were a monopoly controlled primarily by the US or Russia, nations such as Venezuela and Cuba who are threatened by the US and subject to an arms embargo, would be unable to defend their territory and their people. This is where our arms industry would help out internationally. The products of an arms industry could be exclusively defensive and exclude weapons such as cluster bombs and "dime" weapons intended to maximise killing and maiming. Just think of the resources that such a policy would free up and think of the goodwill this would create around the world! Think of the debate that could be had in Britain about these options. It might even restore the confidence in British politics destroyed by this government. Think of the lives that would be saved. If Britain really did pursue such an ethical foreign policy, it would not only change the world but really make Britain a leading force for good.